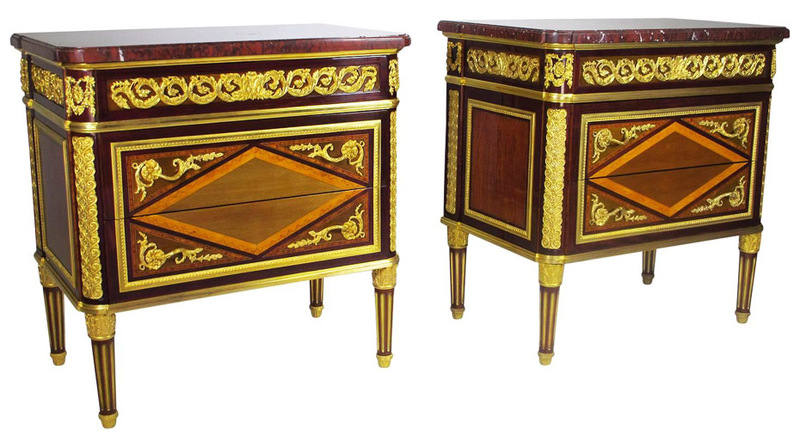 A Very Fine Pair of French 19th Century Louis XVI Style Ormolu-Mounted Mahogany, Amaranth and Sycamore Marquetry Demi Commodes After a Model by Jean-François Leleu by Maison Picard, Paris. 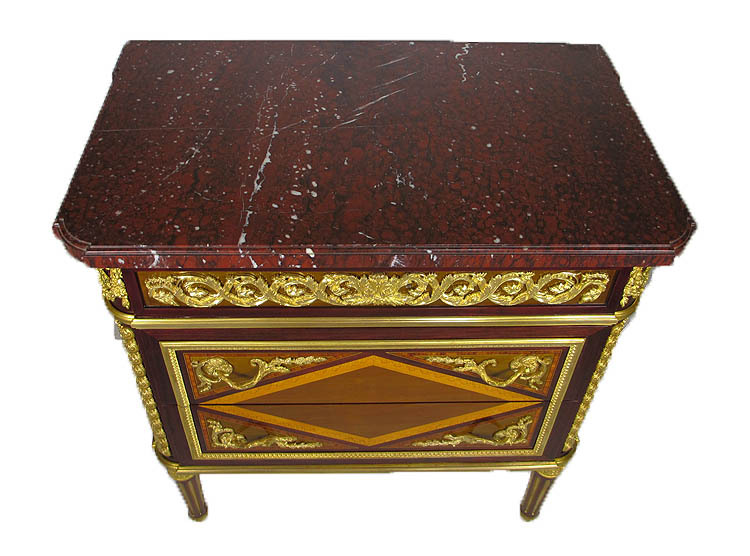 The rectangular Griotte Uni marble top above a scrolling acanthus frieze, the front drawer, above two further drawers inlaid with a lozenge-shaped panel and applied with finely-cast scrolling acanthus handles, with paneled sides decorated with fleur-de-liz fitted trellis-parquetry, on acanthus headed tapering fluted legs and capped feet. 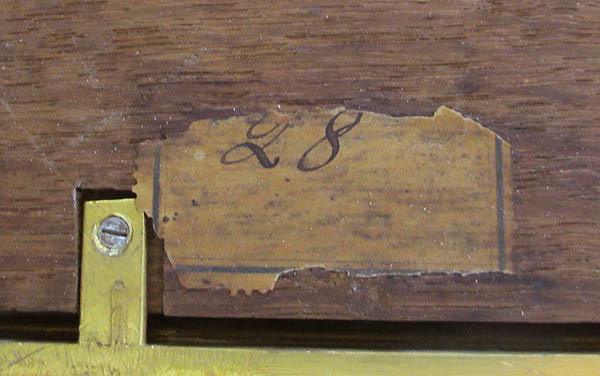 Stamped "Picard Paris - Fabrique d.Ebenister - Fundée en 1839 - Faubourg St. Antoine 26". Circa: Paris, 1860. 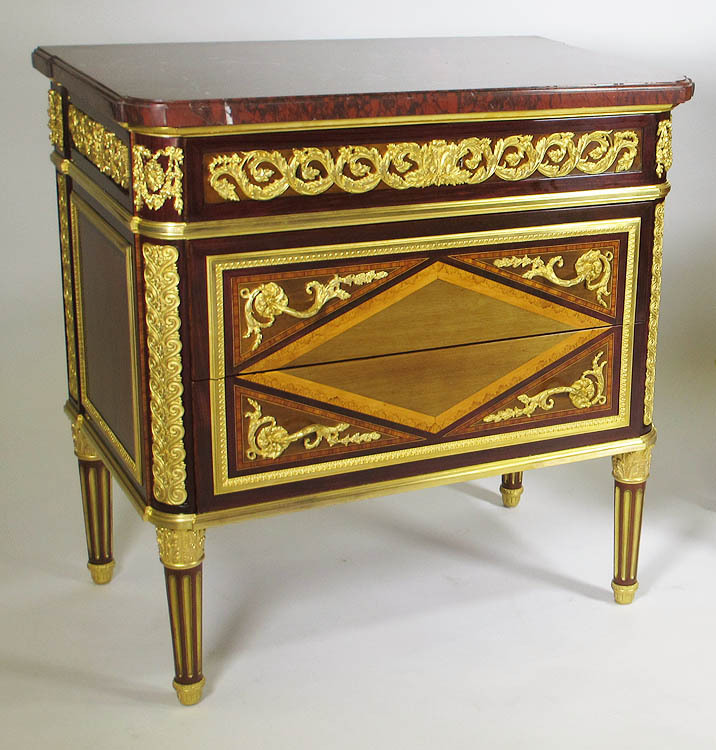 The inspiration for these fine demi commodes comes from the pair delivered by Jean-François Leleu (maître 1764; d. 1807) in 1773 for the Duchesse de Bourbon's bedchamber at the Palais-Bourbon. 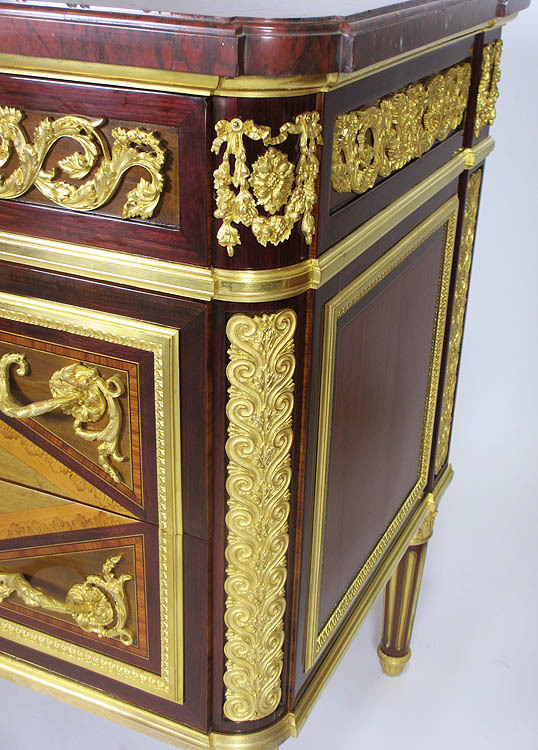 Originally inlaid with fleur-de-lys marquetry, the lozenge-shaped front panel was re-veneered with mahogany at the time of the French Revolution. 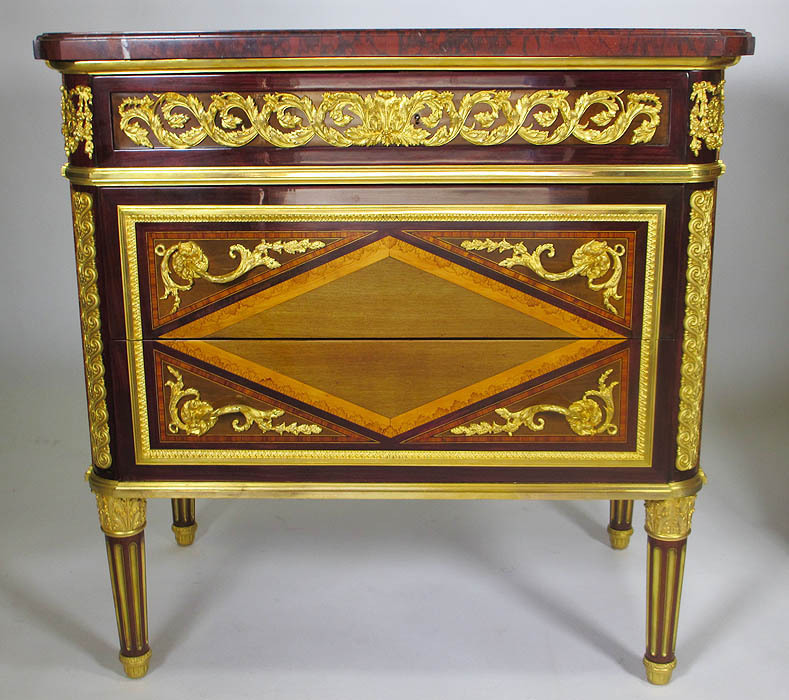 The original pair of commodes now reside at the Petit Trianon in Versailles. 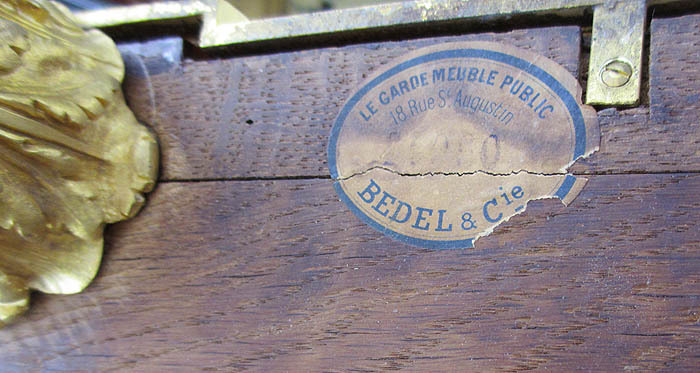 The Maison Picard was founded by Henri Picard, a renown French fondeur, doreur and ébeniste, recorded as working in Paris from 1831 to 1864. 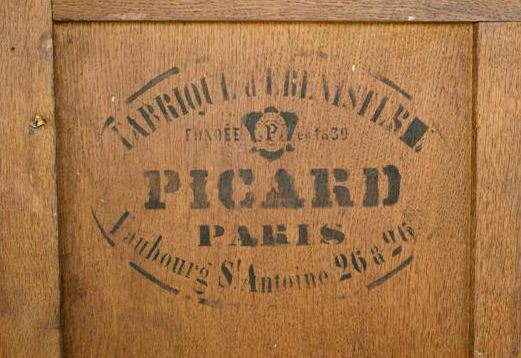 As a fondeur and bronzier, Picard's works are renown for his fine quality casting and chasing as well as well as for his magnificent mercury gilting. 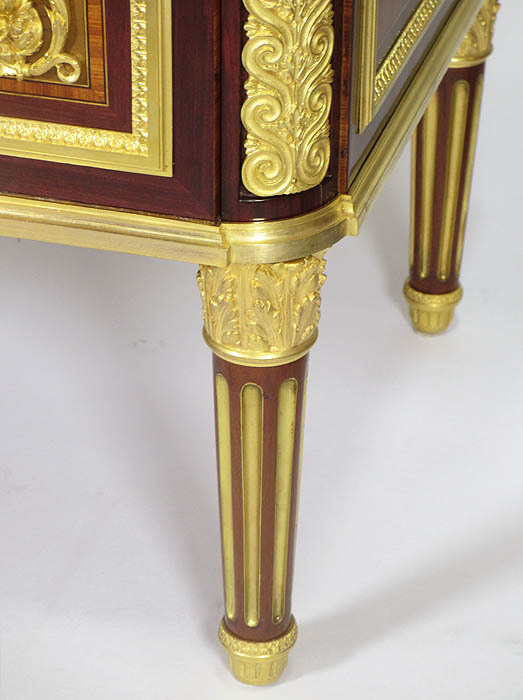 His works are highly regarded by antique experts and collectors alike. 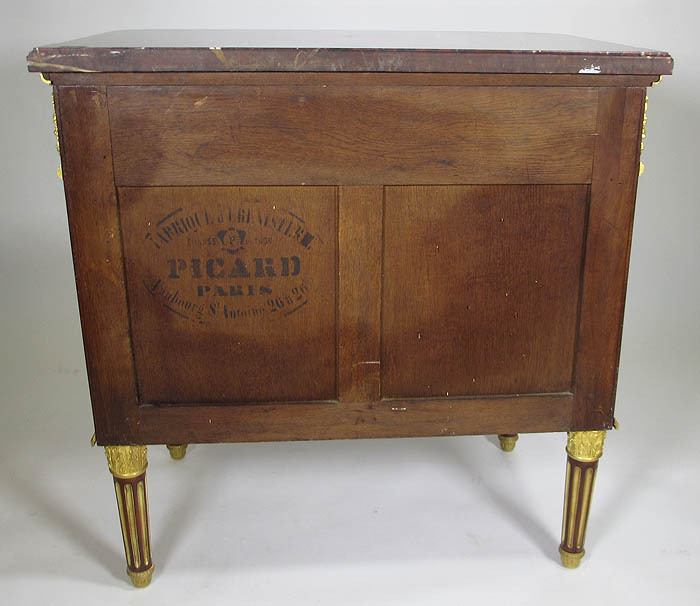 Picard was commissioned by Emperor Napoleon III to supply furniture and decorative items for his apartments in Fontainebleu, now on exhibit in the Louvre.